Previous post"You Know... It's Always Something"... But It's Never One Thing. When I wrote my third baseball related book Engineering The Superhuman Pitching Machine, Volume 2: Conducting a World Class Pitcher Assessment, the idea of linking a physical assessment to a video analysis of throwing mechanics was uncommon. Now most major programs use a physical assessment of some sort, but there are still many instructors, coaches, and parents who don’t truly understand the importance of addressing physical constraints while changing mechanics to improve performance. Physical and biomechanical constraints/attributes are intimately interwoven. Often one spawns the other (e.g., Are you tight because you throw this way all the time, or do you throw this way because you’re tight?). Physical or structural related contributors are probably the most important variables to assess and correct, because they impact all of the other categories of factors influencing performance and arm health. 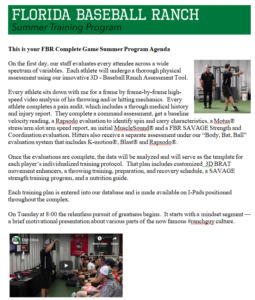 As I gather more knowledge and understanding of the dynamics and dangers of elite throwing, it baffles me that anyone can recommend any mechanical adjustments, design a throwing plan (including long toss, and weighted balls), create a weight training plan, or make any effective decisions about recovery or workload without first examining for physical or structural related variables. Many times as coaches, we ask a player to perform movements or tasks of which he is physically incapable, or for which he is woefully ill prepared. If we haven’t assessed him physically, we have no way of knowing what his capabilities or limitations may be. And we may be putting him at increased risk of injury. to eccentrically control the peri-scapular muscles and the rotator cuff at high speeds, while the shoulder is in long-axis distraction, you could be putting your labrum and your UCL at risk. For more on this concept check out Scaptivation: Bulletproofing the Next Generation of Elite Power Arms. Glenohumeral Internal Rotation Deficit (GIRD): Internal rotation of the shoulder joint occurring during the last 20 degrees of elbow extension is a movement critical to the health and durability of elite power arms. It is a fundamental component of a natural, rotional deceleration pattern. Pitchers tend to lose internal rotation of the shoulder after every outing. It must be restored through a combination of passive stretching, manual therapy, and motor control exercises. Thoracic mobility deficit to arm side: Early torso rotation (before weight bearing foot plant) has been identified as a significant contributor to increased valgus stress on the UCL. Major league power pitchers rotate their torsos 14% earlier than soft throwers. If a pitcher meets resistance due to hypomobility in the thoracic spine as he rotates his torso to his arm side, he will bounce out of that twisting maneuver and his torso will tend to rotate open before his front foot hits the ground. Tight hip flexors on trail leg: Tight hip flexors on the trail leg will inhibit stride length and direction. This can rob a pitcher of power and durability. Tight quads: When the quads are tight, the pitcher usually performs poorly on the deep squat portion of the functional movement screen. Tight quads end to accompany poor glute activation during the pitcher’s movement pattern. Tight quads on the trial leg can also shorten stride length and can negatively influence directional line. Lead hip internal rotation deficit: If the pitcher is lacking lead hip internal rotation, his movement pattern can be affected in two ways. First, as he moves out and down the mound, a tight lead hip will begin to unwind early. This will cause the torso to rotate early, placing the medial elbow and anterior shoulder under duress. Additionally, as he attempts to rotate around his front hip to create a rotational deceleration pattern, he’ll hit a structural block and his torso will thrust forward in a piking maneuver, or he’ll vault over his front toe in a linear move toward the hitter. Trail hip internal rotation deficit: Trail hip internal rotation prohibits the pitcher from remaining engaged with the rubber on the inside edge of his back foot. If he is unable to internally rotate his back hip, he may have difficulty initiating a glute dominant drive to the plate. Lack of hip rotation causes the weight to be shifted to the forefoot leading to a quad dominant movement pattern. Quad dominant pitchers spring off the mound early, creating a premature peak ground reaction force and early unraveling of the arm, adding stress to the anterior shoulder and medial elbow. A glute dominant pitchers’ ground reaction force peaks later and his movement pattern is more rotational than linear. He stays connected longer and achieves later launch which results in increased velocity, improved command, and durability. Tight lateral hips: Lateral hip tightness on the directional side can contribute to lead leg disconnects and early torso rotation. Tight lateral hips on the trail leg side can inhibit glute activation. Hamstring tightness on lead leg: If the hamstrings on the lead leg are tight, the pitcher will be unable to adequately flex at the waist. The pitcher’s trunk will tend to pop up prematurely, releasing the stored kinetic energy out of sequence. If the pitcher is able to avoid this maneuver, he will substitute by allowing the front knee to leak forward robbing him of mph and durability. Poor ankle mobility on either leg: For the pitcher to adequately engage his glutes thereby attenuate the forces on the medial elbow and anterior shoulder, he must have adequate ankle dorsiflexion and ankle eversion. If he lacks mobility in his lead ankle, it may be difficult for the pitcher to produce the lead leg ground reaction forces necessary to absorb the energy created on the backside. This could lead to a forward leak of the front knee or lateral instability — both of which can cause unnecessary stress on the soft tissue and/or leaks in velocity or command. If you are a coach or an instructor, please get your players assessed before you try to make any mechanical changes. Failure to do so could be disastrous. Find a physical therapist you like and encourage him or her to come to our CEU course on Feb 25/26 or Mar 31/Apr 1. They will learn our entire process for assessing throwing athletes and they’ll knock out 15 of their required CEUs in the process. If they sign up more than 30 days before the event, they can take advantage of the early bird discount and save $200. Have one of your players sign up for a weekend Elite Performers Boot Camp and join him. Coaches and/or parents are always welcome with a paid attendee. You can shadow your player and watch the entire process. Our next Elite Performers Boot Camp is scheduled for Jan 21/22. Click here to learn more and get registered now. I guarantee it will be the best experience of your baseball career. But don’t take my word for it. “As a high school coach attending this weekends camp, I wasn’t sure what to expect. I have been to clinics all around the south and spoken with numerous college staffs in the past about everything that you covered this weekend. The two players that I brought (Daniel Shelton and Hays Hansford) benefited tremendously from the velocity and arm care sessions. I have to admit that I had no idea what to expect (you have to understand that I see numerous “coaches” trying to push a product or plan just to make money) when I arrived Saturday, but I was blown away by the attention to detail and individual attention. You and your staff were first class the entire weekend. I just wanted to say thank you for making this available to coaches to attend to try and create better athletes. It is definitely something that I will encourage any of my elite pitchers to consider attending”. “I run a pitcher development program just outside of Philadelphia. We are doing everything that you are doing i.e. pain assessment, decel, connection, functional strength, mobility, etc…But I know that there is NO ONE in the country (world) doing what you are doing in the way that you do it. You guys function at an unparalleled level… You engage your students at an emotional level, (key to motor learning) create a super-charged environment of excellence, & then pull the boys through the wormhole. What we find on the other side is life-altering opportunity. Isn’t it time for you to finally pull the trigger and get signed up for the most transformational experience of your baseball career? Call us at 1-866-STRIKE3 (866-787-4533) and we’ll answer all of your questions and sign you up on the spot.